Browse: Home / 2012 / August / 06 / Why The Earth Is Cooling – CO2 Warming Is Only A Tenth Of What The Models Show! Table 1 is TOA OLR for CO2 values from 0 to 1000 ppm and RH at 0, 10, 50, and 90%. Given the data, Modtran can compute the real outbound radiation over time. 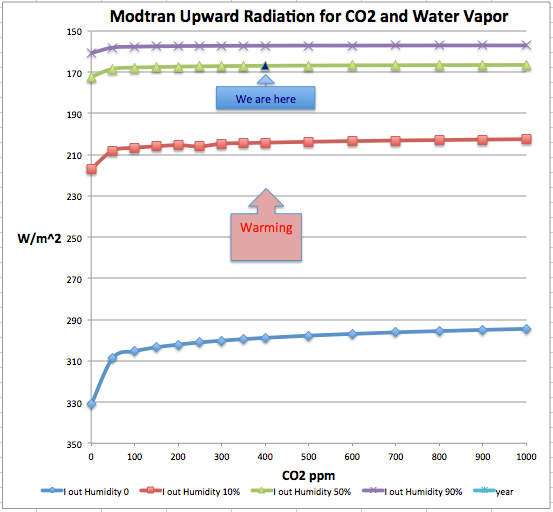 The humidity at 600 mbars and the Mauna Loa CO2 values were applied through Modtran to result in Figure 2. This is a “zoom in” on the blue triangle in figure 1, adding the time dimension. The 600 mbar level for humidity seemed a good compromise, as only one humidity figure could be entered. Fantastic work, Ed! Hoisted by their own petard! Pierre, here in Metro Manila and other provinces in the Philippines, there are lots of forced evacuations — too much flooding, the rains are non-stop. Cooling in our part of the planet seems to be getting more severe. The warmists here idiotically keep arguing that more rains is proof of “man-made CC”. It’s the “It’s God’s Will” explanation. Sometimes He works in mysterious ways that we can’t understand. It is not for us to question. This is a most interesting topic. I have been looking at atmospheric temperature profiles (you can get 12 hourly weather balloon readings for many locations at http://weather.uwyo.edu/upperair/sounding.html) . What is very striking is that the 1976 US Standard Atmosphere is not a good representation of the atmospheric temperature profile at many locations. Also, the upper atmosphere (Tropopause and above) temperatures are not stable – they bounce around. So does the Tropopause – even in the relatively stable Tropics, the Tropopause can change its height by 1km in 12 hours, in Polar regions this can be a 5km change in 12 hours. At 15km, the US Standard Atmosphere is -56.5DegC, but over Guam (13N) it is -75, while at Inuvik (Canada, 64N) it ranges between -50 and -40 depending on season. These temperature differences have an effect on emission strength, particularly in the strong CO2 band from WN 630-710. Futhermore the measured outgoing spectra show that the majority of spacewards emissions in this band are coming from ABOVE 15km . This is clearly shown when the location of the emission is taken into account – the intensity in this band is LESS in the tropics than in temperate locations, due to the much colder high altitude air. I consider that in this band, there will be no Tropospheric heating due to an increase in CO2, just Stratospheric cooling, as emissions are almost wholly from the Stratosphere. I am puzzled: you have applied a humidity of 10, 50, 90% up to a height of 100 km in the atmosphere? Don’t we have basically no water vapor beyond a height of some 10km, because temeprature drops and all water vapor does condense out? Religion is about ‘faith’, some still believe that the Earth is the Center of the Universe. Oh ye of little faith, have faith, ye can then move mountains… and the beat goes on, and on, and on. Remember, all things are relative, even our relatives are a little ‘relative’. It’s Relative Humidity, which takes into account temperature and pressure. And the simple interface on this MODTRAN on-line program doesn’t allow any sophisticated settings. A wrong hypothesis makes people blind, Ed, sometimes for the rest of their life. Perhaps that is the reason that the Norwich police and all those experts have found nothing, convinced as they are that climategate-FOIA is a hacker. Relative Humidity is actual, absolute humidity divided by maximum possible absolute humidity. Sure. But 50% of zero humidity ist still zero relative humidity. I don’t know the options of MODTRAN, but when you say it is so simple in its options, that you can’t clearly define what you are doing, you are still confident to be doing anything of relevance? That is far, far less than convincing! No. Absolute humidity is the water vapor content of a gas mixture; the “maximum possible absolute humidity” would therefore always be 100%. Your definition does not take water vapor pressure or temperature into account. You are defining humidity, not relative humidity. Hi Ed forgive the familiarity I too think that this question is a very large iceberg for the CAGW Titanic. One the IPCC has definitely swept under the carpet. I would much appreciate if you could comment on the notes below as being a fair representation of the diminution effect of increasing concentrations of CO2: as presented by a numerate layman. I have prepared some diagrams which I would appreciate you input on as well. They may even be useful to you. How can I get them to you ?? Remarkably, IPCC Published reports , (TAR3), actually acknowledge that the effective temperature increase caused by growing concentrations of CO2 in the atmosphere radically diminishes with increasing concentrations. This information is in their report, but is well disguised for any lay reader, (Chapter 6. Radiative Forcing of Climate Change: section 6.3.4 Total Well-Mixed Greenhouse Gas Forcing Estimate). The calculated achievable values are in the range of few hundredths to a few thousandths of a degree Centigrade. As the margin of error for temperature measurements is about 1.0°C, these miniscule levels the temperature effects for the efforts of the few nations attempting to control CO2 are marginal, immeasurable and irrelevant. This is especially so as these minute changes have to be seen in the context of normal daily temperature variations at any a single location of 10⁰C to 20⁰C and which can usually be as much as 40⁰C to 50⁰C over the course of a whole year. Although the IPCC tacitly acknowledges that this crucial effect exists, it certainly does not emphasise it. Like the Medieval Warm Period, that they attempted to eliminate with the Hockey Stick graph in 2001, the panel knows that wide public knowledge of the diminution effect with increasing CO2 concentration would be utterly detrimental to their primary message. The logarithmic diminution of the effect of CO2 is probably the reason why there was no runaway greenhouse warming in earlier eons when CO2 levels were known to be at levels of several thousands pmmv. Any unquestioning, policy making reader is unequivocally lead to assume that all increasing CO2 concentrations are progressively more harmful because of their escalating Greenhouse impact. But apparently from the present concentration of atmospheric CO2 at ~390 ppmv, only ~12% of the effectiveness of CO2 as a Greenhouse Gas remains. This can only give rise to a maximum further rise in temperatiure of ~0.18°C. Thereafter beyond 900+ pmmv the effect of increasing levels of CO2 can only ever be absolutely minimal even if CO2 concentrations were to increase indefinitely. Therefore the widely held alarmist policy ambition to constrain Man-made temperature increase to +2°C could never be attained, however much more Man-made or natural CO2 was emitted. Thus it is completely impossible to ever reach the much vaunted limit of 2.0 °C that has been promoted by politicians as a target final limit for man-made CO2 emissions. Send them to Pierre and he can forward them to me.